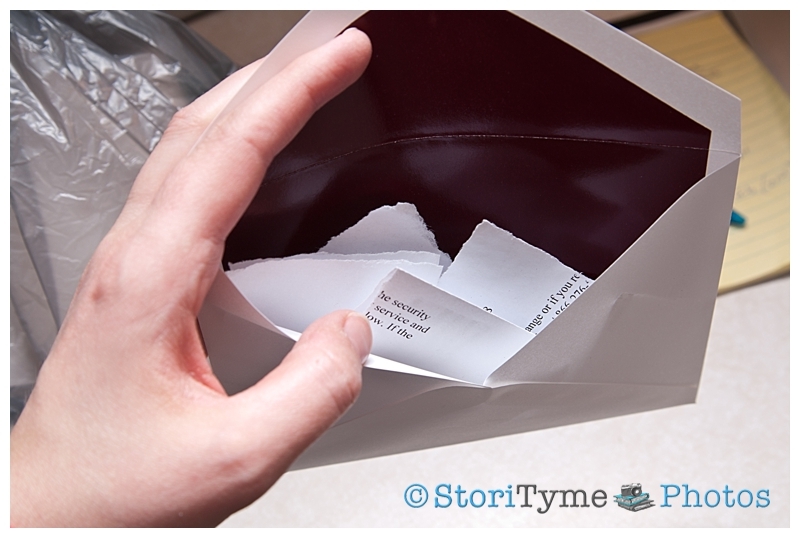 So, I recently challenged myself to do some more letter writing (click HERE to refresh your memory if you need to). And so far, I’ve kept up with my Letter-a-Week challenge. Why, I just wrote one tonight, in fact, to a complete stranger. About a month-and-a-half ago Steven and I started noticing that our mailbox was leaning a bit. Every day it just seemed to get worse. Then, after the big snowstorm on Cadence’s birthday, the little bit of leaning became a lot of leaning. Like a 45-degree angle sort of leaning. Upon closer inspection, we saw that the wood post was completely rotted, and that the cement the former owners used to anchor it into the ground was all split and broken. The only way to fix it was to replace it, but the ground was frozen beneath the snow, which meant we would have to wait for warmer weather. So, we bought some wood shims, thinking it just might be enough to hold the mailbox in place until we could replace it. And it lasted right up until Tuesday. Then, the storm and winds came through and blew the mailbox right over. So, this afternoon while Cadence napped, Steven and I headed outside to get to work. On the curb, right in front of our mailbox was a huge pile of garbage. Apparently, one of the parents that parks in front of our house to pick up their kids from the nearby elementary school decided that it looked like the perfect spot to clean out the car. 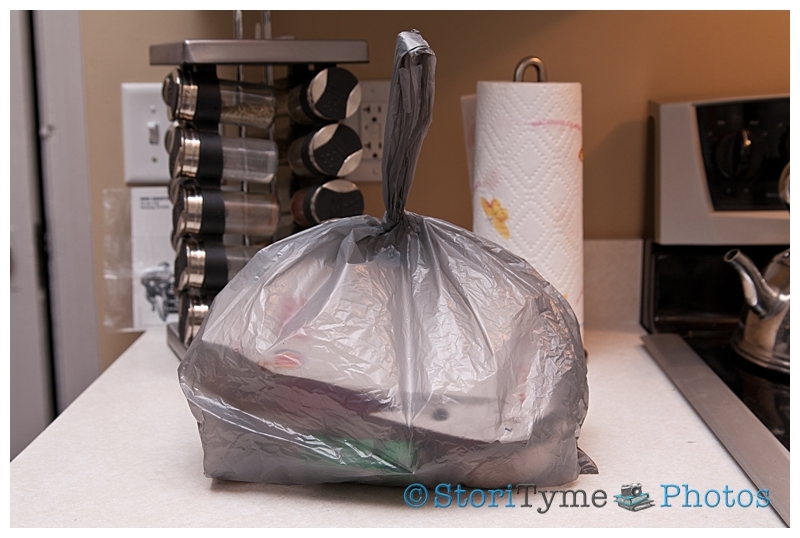 Irritated, I headed inside to grab some gloves and a plastic bag to clean up the mess. I told Steven I wished I knew which parent it was, because I would just sit on the porch tomorrow and give the garbage back. But then, I spied something in the mess that gave me an even better idea. Oh happy day! 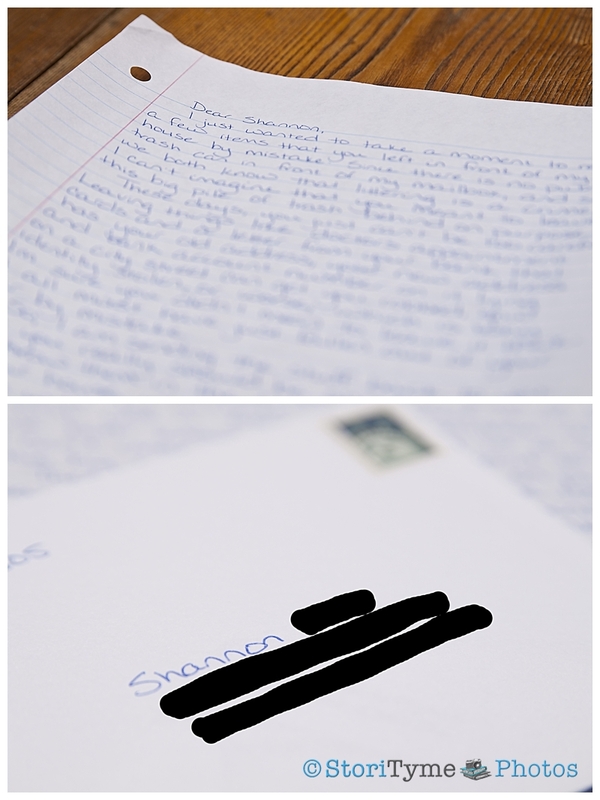 So folks, this week, I’m sending a letter to a girl named Shannon, who should really be more careful not to litter. I just wanted to take a moment to return a few items that you left in front of my house by mistake. Since there is no public trash can in front of my mailbox, and since we both know that littering is a crime, I can’t imagine that you meant to leave this big pile of trash behind on purpose. These days, you just can’t be too careful. 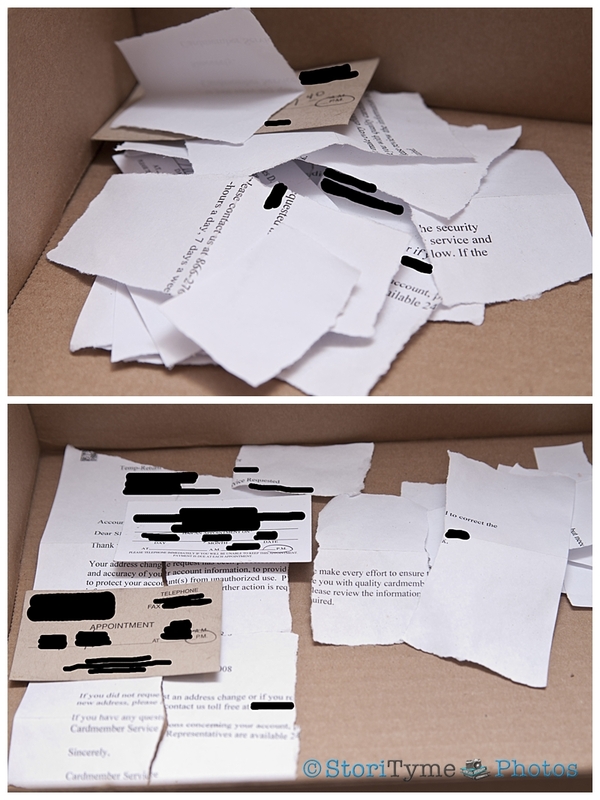 Leaving things like doctor’s appointment cards and a letter from your bank that has your old address, new address, and bank account number on it lying on a city street can get you robbed, your identity stolen, or worse, which is why I’m sure you didn’t mean to leave it there. It all must have just fallen out of your car by mistake. 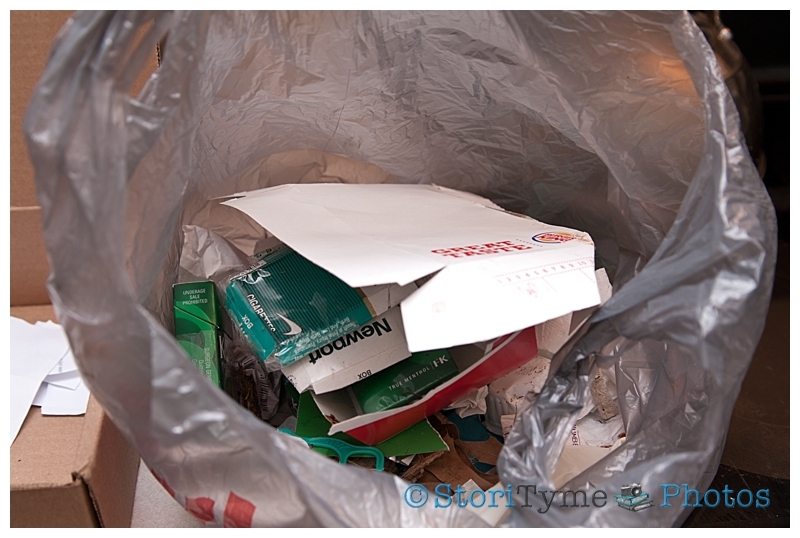 So, I am sending the stuff back to you that you really should be shredding before you throw it in the trash. Your trash. At your house, where the nice sanitation workers will come pick it up and dispose of it properly. 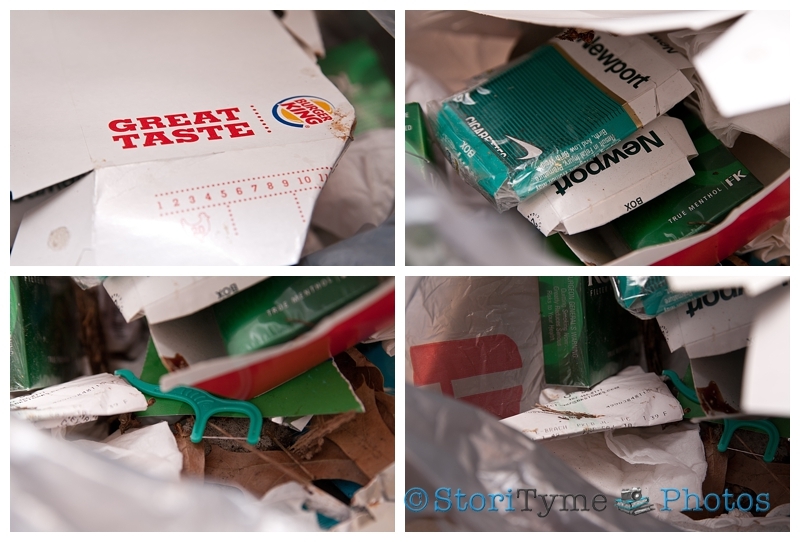 As for the rest of it–the Burger King containers, the half-empty packets of ketchup and ranch dressing, the dental pics, the empty packs of Kool and Newport cigarettes, the half-dozen crumpled receipts–I threw all of those in the trash for you. After all, we all make mistakes. But next time? Next time, I’ll just box it all up and send it to you so you can throw it in the trash yourself. Good for you. I can’t imagine someone just dumping there trash in someone elses yard. I’m curious if the letter from the bank was even opened. I wonder if you will get a reply. Thanks Mom! I don’t know that people are thinking when they do crap like this. And I think the letter was opened, because there was no envelope in all the garbage. She’s just lucky I’m not some shady SOB who would steal her identity and withdraw all the money from her bank account. Next time, she may not be so lucky. You are my hero! This is one of my many pet peeves — people who dump any trash at all, but particularly people who will dump a pile of it (as you said, it looks like they’re just cleaning out their car!) Yech! I hope she gets the point, but if she doesn’t, I’m looking forward to the pictures from your neighbors’ security cameras! That’s hilarious! You have guts. Good for you.